Biblical Kosher is defined by the Scriptures in the Torah (First five books of the Bible) and not by a set of traditions or man-made rules. Specifically, the parameters for Kosher are outlined in Leviticus 11:46-47 “This is the law of the beasts, and of the fowl, and of every living creature that moveth in the waters, and of every creature that creepeth upon the earth: To make a difference between the unclean and the clean, and between the beast that may be eaten and the beast that may not be eaten.” The Hebrew word for “clean” is not Kosher. The Hebrew word for clean is tahowr which simply means pure or has gone through a process of purification. Just because an animal is considered “clean” doesn’t make it proper food for consumption. In other words, a cow standing in the field is not “clean” until it is properly slaughtered and the blood drained from the meat before cooking and eating. There is a process of purification that happens in the life cycle of the “clean” animal from slaughter (death) to a proper and fit meal or offering. Tahowr or clean is the opposite of tame’ or unclean which simply means impure or defiled. So what does the term kosher mean and where did it come from? Kosher is derived from the Hebrew word “kasher,” which means “proper” or “pure” and has the same base definition as tahowr. Many times companies cannot afford to pay the high prices of being certified with a symbol so if there are any questions on whether they still adhere to these principles you can always call the company and ask them. 1. Whatsoever parteth the hoof, and is clovenfooted, and cheweth the cud, among the beasts, that shall ye eat. (Lev. 11:3) Common sources of food that meet this criteria is beef, lamb, goat, venison, and buffalo. Pigs do have a split hoof but they do not chew the cud so they are unclean while rabbits chew the cud but do not have a split hoof so they are also unclean. 2. These shall ye eat of all that are in the waters: whatsoever hath fins and scales in the waters, in the seas, and in the rivers, them shall ye eat. (Lev. 11:9) Many varieties of fish may be eaten such as salmon, trout, tuna, haddock, and all fish that have both fins and scales. Seafood is not clean because they do not have fins and scales. Shrimp are often referred to as cockroaches of the sea. They clean up the sea like a filter and hold in all of the poisons and toxins. Most fish like carp and catfish that do not have scales are bottom feeders and clean up the waters. Would you eat a pool filter and call it food? 3. All fowls or birds are clean except the: Eagle, Ossifrage, Ospray, Vulture, Kite (all kinds), Raven (all kinds), Owl, Night Hawk, Cuckow, Hawk (all kinds), Cormorant, Great Owl, Swan, Pelican, Gier Eagle, Stork, Heron (all Kinds), Lapwing, and the Bat. 1. Mixing dairy and meat products- This concept derived from the Torah passages that speak of not boiling a kid (baby goat) in its mother’s milk (Exo. 23:19/ Exo. 34:26) This is clearly not a part of the regular dietary law as it is spoken of in the context of giving tithes of the land and not clean and unclean eating. Yahweh wanted to make a difference between His people, Israel, and the pagan nations around them who gathered the harvest in their temples and then offered a kid boiled in its mother’s milk to their pagan gods. He wanted them to not learn the way of the heathen (Jer. 10:2) and adopt it in their time of bringing in the tithes of the harvest. 2. Eating foods not blessed by a Rabbi- Something is not made clean simply by the blessing of a Rabbi otherwise Yahweh would have told everyone to bring their food to Aaron and Moses to bless before they ate it. This is leaven from the Pharisees that makes you believe that you must go to a man to receive instruction and blessing rather than seeking out the clear answers in Torah yourself. This is no different than putting unclean meats on your dinner plate and praying to the God of Israel to bless it to your body. 1. Eating Kosher was done away with when Yeshua (Jesus) died on the cross. 2. Eating Kosher is for the Jews only. 3. Eating Kosher may have physical benefits but it is not sinning in any way. 4. Eating Kosher was done away with when Simon Keefa (Peter) received the vision in Acts 10. 5. What about Mark 7:15? 6. What about Romans 14? Is kosher just for the Jews? First you would have to determine that Torah is a set of laws just for the Jews. Fortunately, the scriptures are not silent about this matter. Exo. 12:49 “One law shall be to him that is homeborn (the Jews), and unto the stranger (Gentiles/nations) that sojourneth among you.” How about another example: Lev. 24:22 “Ye shall have one manner of law, as well for the stranger (Gentiles/nations), as for one of your own country (the Jews): for I am Yahweh your Elohim.” The notion that somehow Yahweh created different laws for different people is a foreign concept and one that is completely unscriptural. Kosher is part of the laws that Yahweh gave to Israel and to everyone that wants to be a part of His family as well. There is no doubt that eating a kosher diet has tremendous physical benefits such as lowering cholesterol to limiting risks of certain types of cancers. How can a simple thing like what we eat be a sin? What is sin? The Jewish apostle Yochanan (John) gave us a clear and simple definition of sin: 1 John. 3:4 “Whosoever committeth sin transgresseth also the law: for sin is the transgression of the law.” Shaul (Paul) reinforces this statement by stating: Romans 3:20b “for by the law is the knowledge of sin.” So, forsaking any part of His law is violating it and therefore committing sin against the law of Yahweh. Not keeping kosher as outlined in the Torah is a sin. This is a classic use of taking a small portion of scripture and pulling it out of context to help justify a false doctrine that is not supported by any of the other scriptures. In context Simon Keefa (Peter) was in prayer on the rooftop of one named Simon the Tanner and as he prayed he received a vision of a sheet that was unfolded and beheld all kinds of unclean animals, birds and insects. Imagine this as a Fear Factor show with a container full of hissing cockroaches and you are told to rise, kill and eat. Simon Keefa responded in a manner that is probably consistent with what most people in the western “civilized world” would have done unless it was pork chops and shrimp kabobs. The interesting thing is that Simon Keefa after walking with the Messiah all of this time he still reacts by saying, “Yuck! Disgusting! Get that garbage out of my face!” Well, not exactly but he responds with, “Not so, Lord; for I have never eaten anything that is common or unclean.” You mean Simon didn’t get the memo that followers of the New Testament Messiah could eat whatever they wanted if eaten with thanks? Apparently not or perhaps this law still is in force. But that is not what the whole point of the vision was all about!!! THIS IS WHERE THE TYPICAL LESSON ON THIS PASSAGE ENDS! Don’t stop there but keep on reading and you will see what this is all about: Acts 10:28 “And he said unto them, Ye know how that it is an unlawful thing for a man that is a Jew to keep company, or come unto one of another nation; but God hath shewed me that I should not call any man common or unclean.” So you see that the whole vision was about how the Jews who were supposed to be priests and prophets to the nations were not fulfilling their calling because they viewed those of the other nations as unclean. Even when the Gentiles/Nations were converted they were still looked at as being less significant or common when compared to the Jews. Yahweh was correcting this misconception to Simon Keefa who had a particular hard time with this concept because we find another passage in Galatians 2:11-12 that states that Simon was rebuked by Shaul for not eating with the Gentiles when a group called the “circumcision” came because Simon feared their adherence to the false teaching that the Gentiles that had come to the faith were unclean or common and not to be associated with and treated as less important. Mark 7:15 is an infamous verse and is always thrown around as a “key verse” in explaining why we do not eat kosher anymore as believers. When studying from our modern translated Bibles you will notice that there are certain phrases and words that are in italics. If you look in the beginning notes of your Bible you should find an explanation for why they are there. These are additions by translators that were not schooled in hebrew culture, language or law and therefore did not know what certain things meant and wanted the readers to understand from their perspective as a way of clarifying the statements. These statements are NOT inspired by God and in some cases, like Mark 7 it is downright wrong. If you read the whole chapter of Mark 7 you will read about the context of what Jesus (Yeshua) was talking about. He was addressing the issue of ceremonial hand washing before eating. The Pharisees (who were a small sect of the Jews who twisted the scriptures for there own political reasons) saw Yeshua’s disciples not washing their hands before the meal and took issue with it and accused Yeshua and His disciples of breaking the law of God. Yeshua explained that it is not what enters a man that defiles the man but what comes out of the heart and later on speaks of the Pharisees as being a cup washed on the outside and dirty or unclean on the inside. This exchange had nothing to do with kosher law but about hand washing that is not even in the Torah/law at all…these were made up laws by the Pharisees to make the Torah/law a means of keeping people following their rules and not God’s. This is why Yeshua has so many confrontations with them about the law. So, translators (who did not understand that the law is still in effect) added a false explanation at the passage stating that “thus he declared all foods clean.” You can see very easily and quickly how “off” this added assumption is and does not fit scripture as a whole but serves an agenda to remove the law and its importance in the believer’s life. Before tackling Romans 14 and any of the Pauline epistles, a basic understanding about who Paul was and what he stood for needs to be established. Most teachings about Paul and his letters have been by Christian speakers and teachers and unfortunately they have been misconstrued to create conclusions and false assumptions to back up the speaker’s theology rather than really reading it as it was plainly written. What also needs to be established is how the food laws/instructions were originally given by Yahweh and what Shaul was actually speaking about in Romans 14. Did you know that the Romans 14 passage does not refer to kosher law at all? Let’s look at the whole chapter in context instead of just pulling out little isolated verses that can be twisted to say whatever we want them to. There are really two different subjects that Shaul is addressing in Romans 14. We have to understand that the assemblies in the days of Shaul were a mixed group of believers stemming from traditional Jews (from the southern kingdom), those from the scattered northern tribes of Israel who had assimilated into Greek culture (Hellenized) and were referred by Shaul as “the Greeks”, and gentiles who came out of various Pagan cultures. So you can see very quickly that there were probably a lot of differences of opinions and views as to what the scriptures had instructed them and what was expected of them as believers. Some in the assembly at Rome believed that believers should keep a strict vegetarian diet with no meat, whether clean or unclean and this thought came from the original diet given by Yahweh in Genesis 1:29. However, Shaul was addressing those that rested on the Torah foundation of keeping a kosher diet starting in Genesis 9:3 and reinforced in Leviticus 11. Shaul tells them to not judge those that keep a vegetarian diet as being “weaker in the faith.” This discourse had nothing to do with annulling kosher law whatsoever. The issue addressed was viewing one day “holier” than other days. This is not where Shaul advocates Sunday worship for the gentiles and Shabbat (Saturday) worship for the Jews. This is about fast days that the Jews had traditionally kept as special remembrances to historical happenings that directly affected them. It can be read about in Zechariah 7:5-6. Kosher law, although at its surface seems to be a basic and simple requirement, has so many deep and profound significances as to why we are to be vigilant in keeping these commandments. This is so much more than what to eat and what to not eat but at its core is a foundation for determining what is clean and what is unclean. Isn’t this the very essence of what believers want to know in this day and age; what is clean or pleases the Father and what is unclean or displeases the Father? At the very heart of kosher we learn that there are outward signs that animals have that show what is happening on the inside. By looking at the hoof and watching a cow chew a cud we know, by kosher law, that this animal is clean. In the same fashion we can look at the lives of people around us and get a fairly good idea as to whether they are clean or unclean. How can we draw this connection? In Acts 10 Yahweh compares people to animals in Simon Keefa’s vision as an object lesson to teaching him about a key principle. Yeshua uses a similar connection and puts it this way: Matt. 7:15-18“(15) Beware of false prophets, which come to you in sheep’s clothing, but INWARDLY they are ravening wolves. (16) Ye shall know them by their fruits. Do men gather grapes of thorns, or figs of thistles? (17) Even so every good tree bringeth forth good fruit; but a corrupt tree bringeth forth evil fruit. (18) A good tree cannot bring forth evil fruit, neither can a corrupt tree bring forth good fruit.” What does this have to do with kosher? We are instructed in the Torah to watch for certain characteristics in the animals to know if they are clean or not. False prophets are like those animals that exhibit one of the traits, such as a split hoof, and not the other trait of chewing a cud. 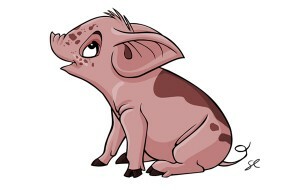 A pig is such an animal and one could easily see the split hoof and overlook the fact that it does not chew the cud. It is like a wolf in sheep’s clothing because inwardly there is poison and things that will lead you in a path to destruction but outwardly it almost seems okay to digest. Just like the fruits on the trees you will know if something or someone is clean or unclean. Learning how to determine clean and unclean will sharpen your discernment in knowing who is trying to deceive you or not. Remember in the Garden of Eden that Adam and Chavvah (Eve) were told not to touch of the fruit of the Tree of Knowledge of Good and Evil. One of the first laws given to mankind was a dietary law and in fact the whole fall of mankind was a result of disobedience to this simple yet powerful concept. Genesis 3:3 “But of the fruit of the tree which is in the midst of the garden, God hath said, Ye shall not eat of it, neither shall ye touch it, lest ye die.” The Hebrew word for “touch” in this passage is, naga, and it is the same word used for touch in Leviticus 11:8 in regards to unclean animals. Lucifer downplayed this law by minimizing its importance just like so many believers do today. Not caring about what is clean and unclean is a path to deception. The other great understanding that comes out of kosher law is in the Hebrew word for clean, tahowr. This means clean or pure and this same word is used to describe the gold used in the making of the Tabernacle of Moses. Each article of the Tabernacle was to be covered with tahowr or pure gold (Exod. 25, 28). Gold is not pure in its raw form but it must be purified by heating it and the impurities of the metal rise to the surface and can then be effectively removed. Then it is considered pure gold, fit for the Tabernacle. A clean animal is not meat to eat until it is mercifully slaughtered and the blood is drained and not retained in the meat. Once cooked properly, then it is fit to be food. Our lives in like manner, start in a state of uncleanness. We cry out for deliverance and we are declared clean as we repent of our unclean ways and turn toward the Messiah. Then the Master takes us and puts us through the fires of life to bring the impurities to the surface so they can be removed and our lives purified (tahowr). Then and only then are we fit to be articles in His temple and a sweat smelling aroma before him.